Radio talkback programs introduced more public participation and debate to the air-waves and many changes in station ownerships were to follow from the mid sixties. Frequency modulated (FM) stereo broadcasting begins and makes a big impact as listeners support the better sound quality option. More recent times sees the spread of narrowcasting and community radio and we consider what the future has to offer. 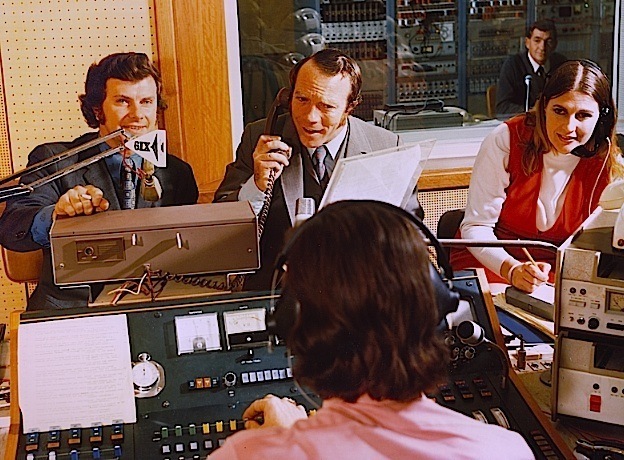 Radio talkback shows became popular in the 1960s. At first it was illegal to broadcast material via the telephone, but this was changed in 1967. Telephone interfaces were designed with a seven second delay to enable any profanities to be detected and censored before broadcast. In 1967 Perth Radio’s operations ceased at the Applecross site and the OTC began vacating the site. The wireless facility was then decommissioned and the mast dismantled. On 14th October 1979 the Wireless Hill Telecommunications Museum officially opened on the Applecross site and in 1994 the Institution of Engineers, Australia, erected a plaque on the site in recognition of the heritage significance of the former wireless station and the contribution of engineers in the history and development of Australia. The closure of the Applecross site in 1967 was the result of a transfer of the stations operations to Bassandean. The station was then officially decommissioned and the site was vested in the City of Melville in August 1969 for the purposes of developing it as an urban bushland reserve, and was named Wireless Hill Park in February 1971. The Wireless Hill Telecommunications Museum was officially opened in 1979. Together with the bushland reserve it is listed on the Register of the National Estate, West Australian Heritage list and City of Melville Municipal Inventory. At the time Perth Radio’s operations ceased, the bushland, was slowly regenerating open woodlands of Banksia (Banksia spp), Jarrah (Eucalyptus spp) and Marri (Corymbia spp). The land was vested in the City of Melville in August 1969 for the purposes of developing it as an urban bushland reserve, and was named Wireless Hill Park in February 1971. In 1967, BTW Channel 3 in Bunbury opened. In 1968, GSW Channel 9 (servicing Albany and Great Southern) opened. 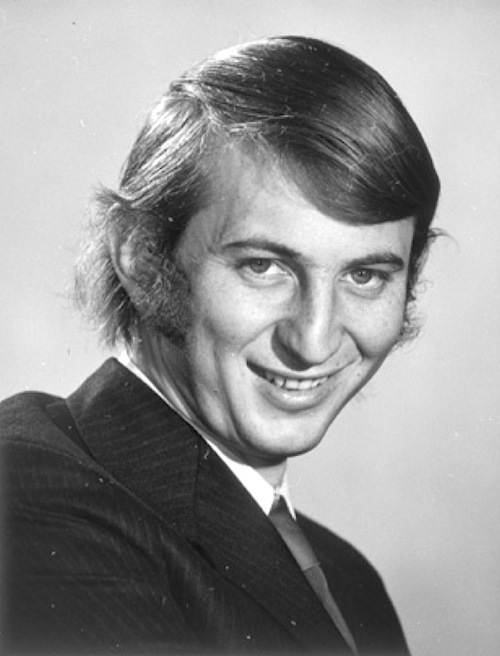 Dennis Cometti is best known as a sports commentator, his dry wit has made him a legend, though his oldest fans will remember his start in the media as a top 40 disc jockey at radio station 6KY in 1968, one year after his league debut for West Perth as a 17 year old. On November 5th, 1968, Morse telegraphy was last used in Australia between Roebourne and Wittenoom Gorge in the north-west of Western Australia, just eight months short of 100 years after the transmitting of the first telegram. In 1969, following protracted negotiations, the Applecross Wireless site passed to the City of Melville for community purposes in August 1969. 6PM was sold to Sir Frank Packer and the Whitford Broadcasting Network was renamed Consolidated Broadcasting System (CBS). In 1969, The Herald and Weekly Times took over W.A. Newspapers and of course 6IX with its country radio stations, known as WACN (The WA Country Network). Stations in this group were 6WB Katanning, 6MD Merredin and 6BY Bridgetown. But owing to Government media ownership laws, the 6IX Radio Network was then sold to TVW Limited in July 1970. 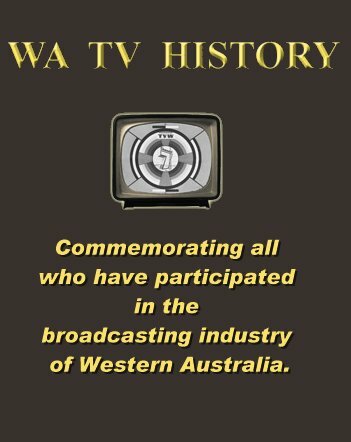 In 1971, VEW Channel 8 in Kalgoorlie and VEW Channel 3 in Kambalda opened. In 1973, STW-9 purchased radio stations 6KY and 6NA for the sum of $1,101,018 and moved out to join Channel 9 at their Dianella site. In 1974, GSW Channel 10 (servicing Albany blind spot) opened. In 1975, the Australian Telecommunications Commission was established, trading as Telecom Australia – separating the Australian Postal Commission and the Australian Telecommunications Commission. 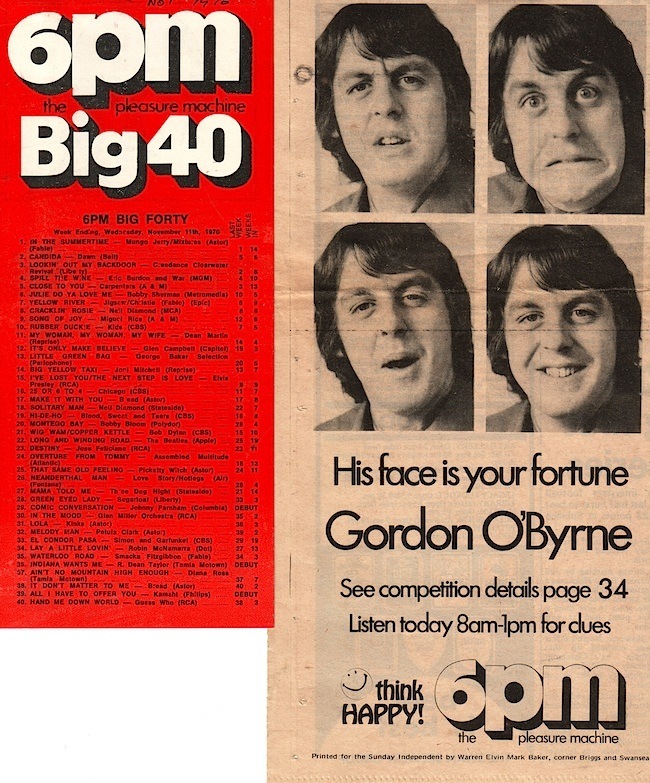 This was also the year colour broadcasts were introduced to Australian television. 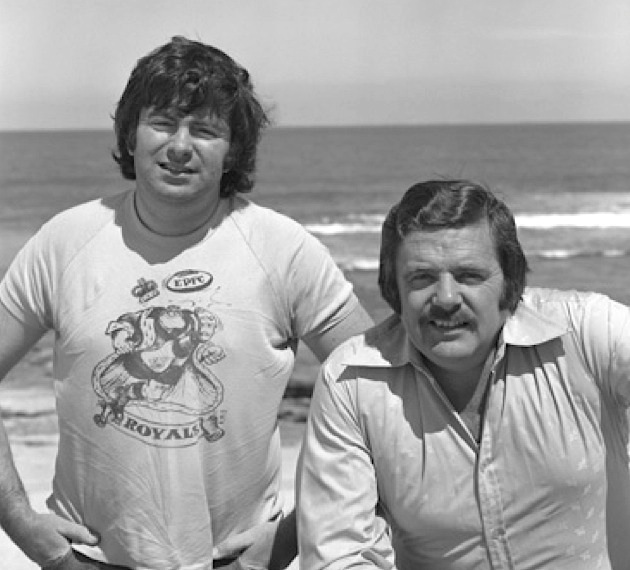 In 1977, GTW Channel 11 in Geraldton opened. In 1978 the Perth Radio VIP operations move once again, this time to Gnangara, a few kilometres to the North of Perth. In 1979, debris from the USA space station Skylab falls in WA’s south west. 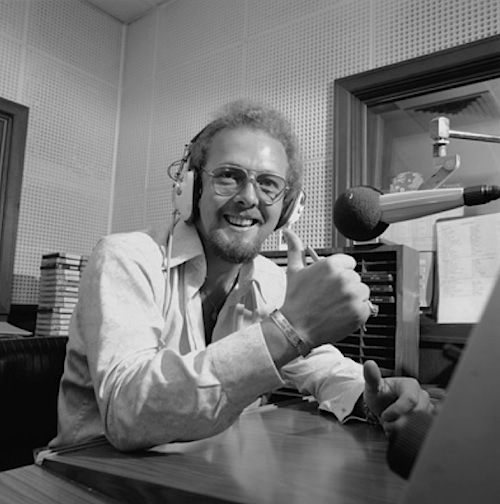 ABC radio avoided broadcasting the same level of contemporary popular music as the commercial stations until the Seventies. 6WFs successful format was to present different themes each night. Country, Folk, Golden Oldies, Nostalgic Rock and Jazz, each provided by a knowledgeable presenter who spoke authoritatively on the subject. When forced to follow the less successful format used in Sydney, the station’s popularity immediately declined. 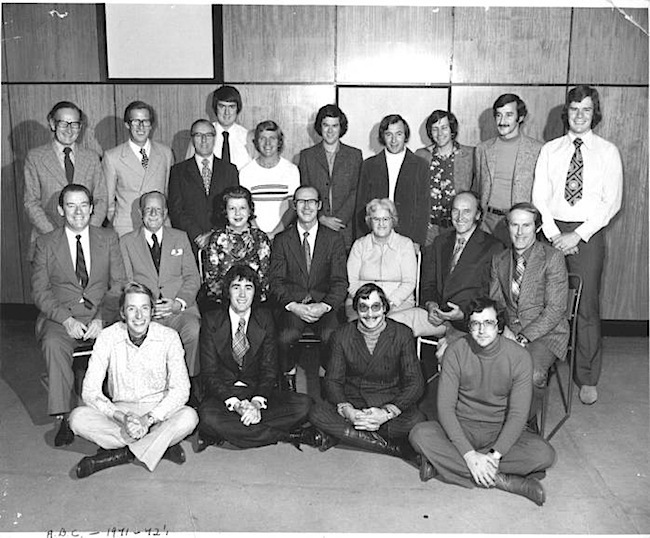 In 1980, 96FM gained the distinction of being Perth, Western Australia’s first commercial FM radio station, being launched on 8th August 1980 by Brian Treasure with the financial support of Kerry Stokes and Jack Bendat. In 1985, the ABC renamed “Radio 2″ as “Radio National” so 6WN changed its call sign to 6RN. Prior to the Radio National concept, Radio 2 was predominantly classical music interspersed with talks, religion, The Country Hour, Blue Hills and educational programs. Radio National now broadcasts national programming in areas that include news and current affairs, the arts, social issues, science, drama and comedy. ABC FM took on the classical music role, whilst 6WF became 720 Perth, the metropolitan local emphasis Perth ABC radio station, with a degree of networked programs. Triple J was created to cater for the youth. 6PB carries federal parliament when in session and news when not. 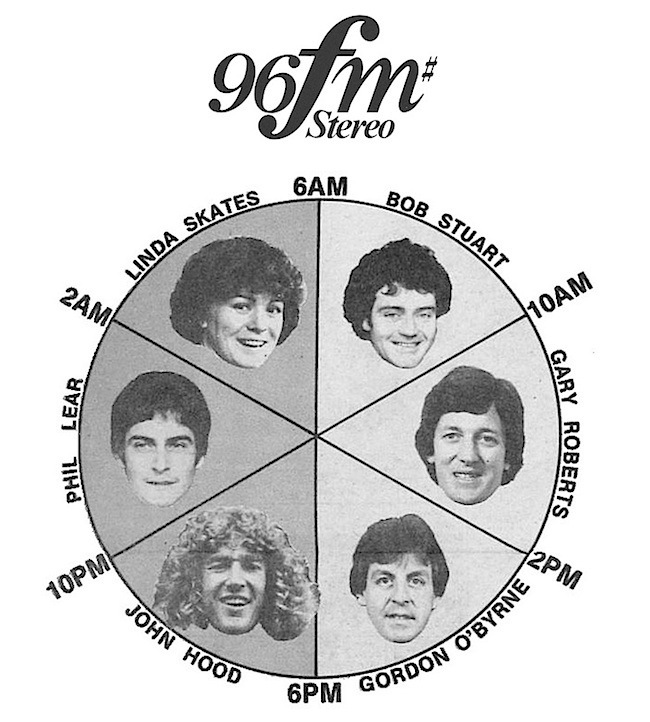 96fm began broadcasting on 96.1 MHz on August 8, 1980 as Perth’s first commercial FM radio station. Here is the station opening which contains a series of historic sound recordings. In 1987, the Friends of Wireless Hill Park is formed with the aim to revegetate and rehabilitate the bushland and maintain its biodiversity values. In 1987, the TAB in liaison with the racing, pacing and greyhound codes purchased 6PR to secure the future of race broadcasts in Western Australia with races broadcast during the station’s popular talkback programs. During the early nineties the station’s current affairs/talkback programs were hosted by Howard Sattler, Bob Maumill, Graham Mabury, Peter Newman, Gary Carvolth and Rob Broadfield. In 1987, 6IX was sold to the Austereo Radio Network who assigned the station a new call-sign 6GL, with the station was branded on-air as The Eagle 1080 AM. When Austereo failed to obtain one of the AM-FM conversions on auction and subsequently sold the radio station to regional operator Radio West who re-instated the original 6IX call-sign. The Frequency Modulated (FM) stations had an edge in quality, being both high fidelity and stereo. Eventually the listeners migrated to the new band and the former top-rating AM pop stations began to suffer in the ratings. Australian television and radio personality John Burgess was the breakfast announcer on 6PM in 1987. John worked for 6PM from 1978 to 1988. He is best known to Australian television audiences for his hosting duties on Wheel of Fortune on the Seven Network, from 1984 to 1996. He later hosted the Australian version of Catch Phrase, shown on the Nine Network. In 1992, Telecom and the Overseas Telecommunications Corporation (OTC) are merged to become the Australian and Overseas Telecommunications Corporation. The traffic then started to decline on the radio circuits following the introduction of satellite technologies. In 1993, Telecom changes its trading name for trading overseas to Telstra Corporation Limited, and then in 1995, Telecom changes it’s trading name to Telstra for domestic trading. In August 1993, 94.5FM purchased PMFM (now 92.9) from Kerry Packer. In 1994, 6PR was purchased by Southern Cross Broadcasting and the TAB secured a special narrowcast broadcast license for Racing Radio. Racing Radio in WA is not a commercial broadcaster, unlike its counterparts in other States, it is a service provided by the statutory body, Racing and Wagering Western Australia (RWWA), which is the controlling body of the racing industry in WA and the licensee of the Perth High-Power Open Narrowcast (HPON) service in Perth operating on 1206 kHz, and several other HPONs and Low-Power Open Narrowcasts (LPON) across the state to promote racing in country areas. RWWA was also formed to take control of the off-course betting activities of the Totalisator Agency Board (WA TAB). Also in 1994, the Triple M network, owned by Hoyts Media, was in financial difficulties and sold to Village Roadshow, who then sold the network to Austereo, in return for a controlling share of Austereo. In 1997, Village Roadshow subsidiary Austereo purchased radio stations 92.9FM (former 6PM) and 94.5FM (former 6KY) from Jack Bendat, but Australian media ownership laws required the divestiture of Triple M (former 96FM), so Village Roadshow sold it to Southern Cross Broadcasting (a division of Fairfax Media from 2007), which also owned AM radio station 6PR. 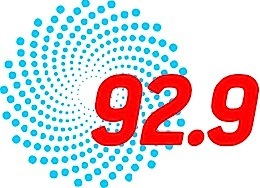 Southern Cross then returned the station back to its original ‘96FM’ branding. Perth’s Gnangara radio station was the main Radiotelegraphy station until the closure of morse code services in February 1999. On 30th June 2002, services from Perth Radio VIP ceased along with all the other Australian coast radio stations. 92.9FM (former 6PM) and sister station Mix 94.5 (former 6KY) was part of the Austereo Radio Network, then on 6 April 2011, Southern Cross Media purchased a majority of the Austereo Radio Network and they were merged to form Southern Cross Austereo in July 2011. Radio West is part of Southern Cross Austereo (formerly known as Macquarie Southern Cross Media and then Southern Cross Media) and operates a long list of commercial regional radio stations, including: 6VA Albany, 6TZ Bunbury, 6BY Bridgetown, 6CI Collie, 6SE Esperence, 6KG Kalgoorlie, 6MD Merredin, 6NA Narrogin and 6AM Northam. More than fifty existing and former staff members of former Perth AM Radio station 6PM (now 92.9 Perth’s Hit Music Station) got together on 21st April 2010 at the Paddington Ale House, Mount Hawthorn to relive “the spirit of the good ole days of radio”. Special thanks to Simone, Marty and Gary who arranged the event. Video courtesy of George Chapman. In 2004, there were six aspirant community radio groups in the Perth area. These were Capital Community Radio (over 55’s format), Western Sports Media (sports format), WA Portuguese Club (Portuguese format), Hits Radio Ltd (general format), Lycourgos Inc (Greek format), and Mr Marwin Naji (Arabic format). The WA Portuguese Club withdrawn its application for a future Temporary Community Broadcasting Licence (TCBL) and no fresh applications from three other previously known groups were received. Capital Community Radio (CCR) and Western Sports Media remained very active and time shared the available frequency of 90.5 MHz until March 2006. On 1 July 2005, the Australian Broadcasting Authority (ABA) and the Australian Communications Authority (ACA) were amalgamated to form the Australian Communications and Media Authority (ACMA). When the Applecross Wireless Station was opened in 1912, the population was only about 117,000, now the Perth metropolitan area has an estimated population of almost 1,700,000 making this city the fourth most populous city in Australia. In 1870, when the telegram service in Perth was one year old, the population was only 8,220, but then during the gold rush it grew from 16,694 in 1891 to 67,431 by Federation in 1901, with the population increasing by about 100,000 inhabitants every decade since then. In 2012 the Wireless Hill Park will celebrate its 100th anniversary and community plans are well underway to mark this historic occasion. Sadly though it seems the museum collection will soon be without a home as the City of Melville moves away from commemorating our telecommunications and broadcasting heritage to concentrating on the indigenous history, the wildflowers, the birdlife and the history of the buildings. Its sad to learn that the City of Melville no longer values our broadcasting history and is planning to dispose of the collection at Wireless Hill, which suggests there must be a better custodian for this heritage material who is prepared to keep the collection together and display it in a more fitting place? A new location where the events and efforts of all associated with this industry can be commemorated. Hopefully this article will revive the names of a few unsung heros who engineered much of early wireless in Western Australia. People who were often without a high public profile. As such this story is only scratching the surface, as theres layer upon layer of personnel who made it all happen. As each decade passes it becomes harder to keep the memory alive and sadly not all value this heritage as we have seen many architectural landmarks disappear from Perth’s skyline, and even more difficult to keep the less tangible items, which do not have monuments to mark their existence. Too often the smaller items are thrown on the scrap heap, leaving little trace of the important role they once played. That sentiment applies equally today if we want to remember our broadcasting history. Community radio offers some refreshing alternatives to the established formulas. Meanwhile, Digital Audio Broadcasting (DAB) can offer more radio programs over a specific spectrum than analogue FM radio. DAB also has a data capacity that enables a station to supply a program guide and real-time information such as song titles, music genre and news or traffic updates. This concept may make an impact once sufficient people own receivers. Then Internet radio gives listeners the opportunity to monitor stations world wide. All these additional choices present the possibility of fragmenting the listening audience, which may impact on the profitability of the long established commercial stations. Radio has an advantage over TV in being able to convey the latest news, weather, traffic and sport reports for people on the move, without the need for highly expensive infrastructure, though new forms of media is getting the edge in breaking news by involving the users in Twitter, Social Networking and self publishing on the World Wide Web and YouTube, all of which can be done from a smartphone that doubles as a mini media centre, computer, games console, and camera (still or video). A world full of users can report extraordinary events faster than traditional news gatherers, as there is sure to be someone somewhere with a smartphone who can report. Being programable, the low cost downloadable applications means that smartphone users may do what ever the imagination of innovative software writers devise. The other advantage of radio is that people can put their minds in neutral and simply enjoy the entertainment, regardless of where they are and what they are doing. Younger generations are exploring new ways to interest themselves, hence traditional media does not hold the same sway over them. New concepts are evolving at a rapid rate, of which some will rise to prominence, then may gradually fade as the next fad comes along. The media is in a constant state of flux, with entrepreneurs continually looking for new opportunities to make money. The old media moguls have not been the recent high technology innovators, though whilst their influence still exists, will attempt to find ways of staying in the game. Hence the long term survival of current media empires is not guaranteed. New search technologies, which come with the web, enable people to locate interesting information, otherwise we would get lost in a maze of content, which is a long way removed from the old days of buying a printed program guide in a newspaper or magazine and restricted to only a handful of station choices. There is a trend for modern media to supply content on demand, and for there to be an infinite source of content. Aust commercial radio and the public service broadcasters are putting competition aside on 6th August 2009 when more than 40 different radio stations hold a simultaneous outside broadcast in Sydney, Melbourne, Brisbane, Perth and Adelaide. 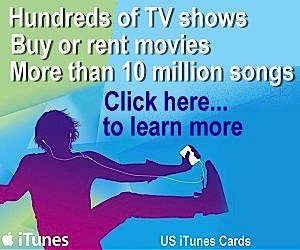 For those with a computer and Internet access, there are more than 6,000 free Internet radio stations available that offer about 300 genres of music from over 150 countries. Though radio is no longer the only way to discover music, with alternate services such as iTunes making it easy to sample a vast range before buying at a very affordable price for instant download. The transistor radio is likely to retain its place in the car, home, workplace or on the hop. The radio airwaves are free whereas the Internet chews up bandwidth, and for the foreseeable future there will be a cost, even with unlimited accounts. In addition, smartphone battery life is currently less than the batteries in a transistor radio. Capitol Community Radio had a different frequency. An excelent history for someone who worked in the technicle and operational side 1964/1990,s.